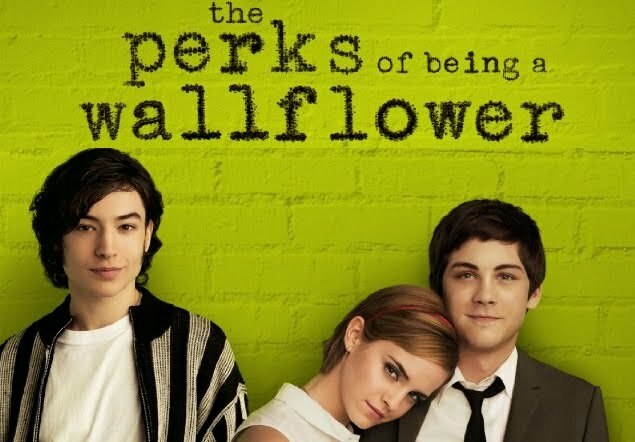 Ezra Miller, Emma Watson and Logan Lerman star in this new film by author-scriptwriter-director Stephen Chbosky. Photo from www.teaser-trailer.com. You can download the soundtrack for free through my Dropbox account. And I happen to also have an ebook. Download it here. 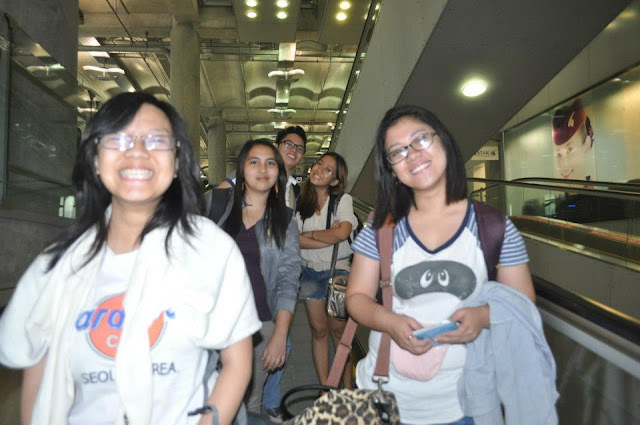 That's me excited to ride their Skytrain. Armed with our foldable city maps and renewed energy even after a sleep-deprived night at the airport, my friends and I went straight to Udee Bangkok—our dorm for our four-day stay at the Thai capital. Since the check-in time is still 2PM, we just asked the owners if we could leave our luggage at their storage room until the check-in time and go on to our first destination. The owners gladly allowed us to do so. And then we’re off. With the same clothes we wore the night before. Yes, we ditched taking a bath because we thought we’ll still be okay. When we got out, the sun literally gave us a warm welcome. Hello, Bangkok heat. Despite the first signs of sweat and greasy hair, Team Bangkok still carried on. Keber. 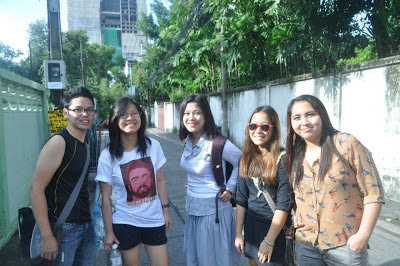 Good thing, the bus we rode was airconditioned. Khao San Road. While we're looking for breakfast. So there, we rode Bus Number 524 and got down at Khao San Road to look for breakfast. We could have opted for a fastfood like McDo, but when we saw their food prices (inflated ng bongga, hahaha), we backed out. Across the street we found a diner that has a pretty appetizing menu. We sat down and ordered a platter of banana pancakes, 3 American Breakfast plates and 2 servings of sandwiches. There’s free coffee or tea that accompanied each meal. In order to enjoy the food, we decided to split it to six and began eating our hearty breakfast. In the background, their television was airing their early morning talkshow. There was this guy that impersonates Lady Gaga and was totally funny. Hahaha. What a great way to start our day. Inside the Complex. Told you, the ~guards are giants. After our breakfast, we looked for a ride going to the Grand Palace Complex. An ~extra friendly taxi driver was offering us a ride—for 150B (each of us), he’ll take us to a lot of temples and a floating market. 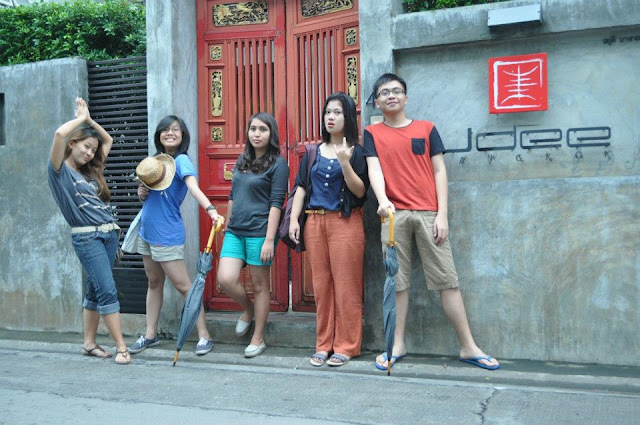 We refused his offer because we felt that we could go to those temples and floating market without spending that much. He told us he’s a huge fan of Pacman—as if that would change our mind. Anyways, we walked towards the direction buses usually ply. I think we rode Bus Number 4 to get to the Grand Palace Complex. It was a little before lunch when we entered the complex. Because the sun was shining so bright that time and the fact that we were not able to take a quick shower before our Palace visit, we were totally stoked. Oily face alert! Hahaha. And yes, there are hundred more tourists visiting the temples along us. Wow. So there, after a few minutes lining up, we were greeted by giant dragon warriors by the entrance. Cameras started clicking again. Tourist Tip: Foreign tourists who are interested to see the Grand Palace would have to pay 400B. This includes a chance to visit the temples inside the complex (i.e. Temple of the Emerald Buddha and the _____), the Royal Money Museum right beside the GPComplex ticket booth and the Vimanmek Mansion, which is a few blocks away from the complex. We suggest you take a cab (40B meter rate) going there since buses do not ply that route. Also, make sure you are not wearing shorts, sleeveless shirts and open-toed footwear because these are not allowed inside the temples. They would ask you to buy their malong/ loose trousers which cost 100-200B. To avoid shedding precious Baht intended for pasalubong and to avoid any hassle on your part, I suggest you wear pants and sleeved shirts and closed shoes (rubber shoes are good enough) when visiting these places. The only consolation is that the malongs sold have beautiful designs so keri lang din naman. Hahaha. Finally, tourists are not allowed to take pictures inside the Temple of the Emerald Buddha, the Royal Money Museum and the Vimanmek Mansion. We postponed going to the Vimanmek Mansion until our last day because we’re really tired. By 1.30PM we’re done visiting the temples inside the Complex and the money museum. We had a lot of fun visiting these temples—that’s very much evident in the pictures. Keber sa oily at pawisang muka! Hahaha. Also, read my other posts on our Bangkok trip here and here. It came up with this surprising finding: if you're losing good people, look to their immediate supervisor. More than any other single reason, he is the reason people stay and thrive in an organization. And he's the reason why they quit, taking their knowledge, experience and contacts with them. Often, straight to the competition. “People leave managers not companies,” write the authors Marcus Buckingham and Curt Coffman. “So much money has been thrown at the challenge of keeping good people—in the form of better pay, better perks and better training—when, in the end, turnover is mostly a manager issue.” If you have a turnover problem, look first to your manager and supervisors. Beyond a point, an employee’s primary need has less to do with money and more to do with how he’s treated and how valued he feels. Much of this depends directly on the immediate manager. While reflecting on that passage I read, I remember how the family usually spend dinner time by asking about what happened to each other’s days. I remembered how my mother talks about her day’s work inside the house and the movies she was able to watch within the day; Father on his Bible study groups and students at the Bible College he’s teaching in; my brothers and sister about school and rides home while I tell them things I learned from work and new stories I got from officemates. Most of the time, I share funny things that happened during work hours or topics we discussed during meetings. And then sometimes, I end up ranting over things that are beyond my control—a project that got sidelined because of tardiness, position papers that got watered down because of several political accommodations, attitude clashes between powers-that-be that affect the whole working environment and many more. I told my parents that felt like this shouldn’t be the case especially if the organization’s goal is for development and better governance. Then they told me that this is something that is very much common in workplaces. There’s office politics and people who relish bad mouthing other people or spreading rumors and bad vibes just when they feel like to. On one hand, my mother advised me to stay away from such people or if they cannot be avoided because we are a small organization, limit mingling with them lest I become a bearer of bad vibes too. On the other, my father told me to just do my job the best way that I can and deliver what is expected of me. After all, I came there to work and hone my skills. Relationships cultivated inside the workplace, while necessary, is still secondary to work productivity. He also told me that I should choose the people I trust carefully, hence the me-sessions group. Hehe. Anyways, I know I shouldn’t be saying these things and that I promised myself that this should be a happy blog—free from the perversions of the world outside, but I feel that I just had to share these to everyone. I wouldn’t elaborate on the flaws I see inside our organization because that is something to be first, internal and confidential, but second, it is unethical to do so. Mr. Richards is right when he said that “Beyond a point, an employee’s primary need has less to do with money and more to do with how he’s treated and how valued he feels. Much of this depends directly on the immediate manager.” But I also think that the other half of this much also depends on the employee—our dispositions and outlooks in life and in work have a similar effect on us the same way our bosses or co-workers affect our outputs. While our bosses may be too grumpy, lazy, domineering or if he takes too much credit on good things you really did, an onus is still placed on us on how we will effectively deal with these. Do we take these situations seriously that we plot how to torture our bosses to death or do we take things lightly and pass it off as another ego-pumping streak for your boss? I dunno with you, but most of time I take these lightly. First, because it wouldn’t do me any good to sulk in the corner and keep all that anger inside me. The sinful thoughts of anger and “murder” I hatch would just make me sick. But second, because doing so would not make me any better than them. Stooping down to their levels and trying to deflate their egos and pride by crossing fires with them or talking behind their back would be an insult to my intelligence and integrity. Sure, I feel bad sometimes, getting sidelined and all, but well, who doesn’t? Coupling that with a lot of hard feelings would just make us guilty overtime. So, keber! In a nutshell, I believe that it is of great importance that we find a leadership that would inspire us to do better and motivate us to achieve more than those we are doing right now. The problems we face inside are rooted with the way the whole team is led—the people who steer us should guide us to the right direction, “matuwid na landas” as the President reiterated. We’ve already taken steps towards contributing to local government development and nation-building; I think it is high time for us to push further the envelope and go beyond the usual and of course, leave all the politicking aside. Because, really, our agenda is the collective progress of each and every community in the country and the citizens that inhabit it. The organization teems with very good and intelligent technical personnel—we’ve got urban planners, environmental advocates, social scientists and future lawyers—and while we know what is ought to be done, we still need a figure that would not just boss around and demand that we produce results for the day. More than that, we need a figure that would really lead us— the one who would set the goals that should be achieved within a given time frame and the things that should be done in order to achieve those goals, tell us that we are wrong, why we are wrong and what should we do to make things right and value us based on the outputs and efforts that have made and initiated. In the end, I know that finding a better leader would take some time, but I really pray hard that that time would come the soonest possible. That is before everyone becomes jaded and ends up quitting. In the meantime, I pledge to be more efficient and productive with my job. I would do the things that are expected of me based on the terms of reference I have signed. I cannot promise not to engage in ranting as this would be the only outlet for my future pent-up angst and disappointments. Hahaha. But I do promise to limit this to me- sessions with the “me- sessionistas.” J My patience threshold is amazingly good so I foresee that I won’t be quitting my job sooner. Sabe nga, we can do all things through Christ who strengthens us. I chose this path and I mean to learn and experience everything and every lesson out there for my own personal growth and development. Life gave me lemons, it would just be good to enjoy the lemonade that comes out of it instead of sulking each and every day. Ohohoho, you can download it by clicking here. :) Get pitch slapped and enjoooooy! September had always been associated with typhoons—for some strange reason, the stronger monsoons visit the country during this month. There’s Ondoy, Pepeng, Karen and the usual lashes Habagat gives. Ohohoho. Given such situation, we thought that our Bangkok trip won’t push thru. Baka biglang mag- force majeure cheber. We did a little monitoring before the week of our trip so we’ll know what to expect. RJ read about flashfloods and stuff and was a bit afraid the trip might be cancelled. Coupled with gut feel and a lot of prayers, thank God our first out-of-the-country vacation was a success! Nyahahaha. Jhessa, RJ and I still reported for half-day work in our respective offices on the day of our departure while Kat, Xave and Ate Chael rested until our 2PM meet-up at PhilTranco Bus Terminal in Pasay. The bus would then take us to Diosdado Macapagal International Airport at Clark, Pampanga. A quick note: For backpackers/ travelers in need of an easier and more convenient route to Clark, I recommend you take the PhilTranco bus. The bus leaves on the dot plus there are no stopovers so it’s pretty good. You could either ride at Pasay- Taft or at SM Megamall in Mandaluyong. For PhP450, you'll reach Clark Airport hassle-free. Check with their main office for the complete ride schedule. Fast forward 12MN. The plane's ready for landing. By the time the clouds paved, we were kinda giddy when we saw flickering lights. Sabe ni RJ totoo pala ang ibang bansa. Hahahaha! When we got off the plane, cameras clicked again. Hahaha siguro ganito talaga mga Pinoys-- we never fail to capture every moment. Bangkok's Suvarnabhumi Airport is definitely nice. I loved how their signages are placed and designed. The foooonts and colors. Hahaha. So there, I took pictures if them and compiled it all on my photoblog. :) Anyways, we proceeded to the nearest TMB to exchange our dollars for baht. By the time we finished our transaction, it's already 1AM. It was already decided that we spend the remaining hours before daybreak at the airport. From there, we'll take the MRT to our dorm. As soon as we found comfortable seats decent for catching powernaps, I dozed off. I thought my friends also snatched some sleep but no, they spent the wee hours talking and laughing and eating tom yum noodles from 711. I woke up to their noise and well, slept again. By 3AM, I'm pretty rested and hungry so I decided to buy something to eat. I was enticed by the picture of the chicken burger in the menu-- there's gulay and all so that's what I took. I got a bit disappointed when I saw my burger. Anyhoo, because I'm hungry I still ate it and wolfed half of Ate Chael's tuna panini. Tidbit again: Bangkok time is an hour late. So if it's 6AM in Manila, it's only 5AM in Bangkok. 6AM. The gates to heaven are now open! Joke. The counters to the MRT opened. We made our way to it and found ourselves thinking how to use the vending machine. Well, it's the same as that of our coin machines used in our own electric train system sans the Thai characters. Good thing, there's an English translation. We also took city maps as if we can really read them properly. Hahaha. It's been three weeks since our four-day visit to Bangkok and I guess I still have a bit of a hangover of everything that happened there. Maybe because I was the last one to upload the photo albums on Facebook and I'm only seeing my friends' pictures just now. Or maybe because I miss the whole gang and everybody's eccentricities which I discovered when we got there. Xavier wears sandos. Jhessa would not really return the things she borrowed especially if she intends to "arbor" your purse. Katrina is like a balikbayan when she goes travelling because everyone in their family even her cousins and all would get pasalubong from her. Ate Chael cannot stand a day without getting a bath and yes, she wears long sleeves even if the weather's hot. RJ eats everything-- from those ~parboiled cockles we had at Chinatown to the snacks up for free taste in Chatuchak. Lol. Or maybe I just want to experience travelling again. I miss the thrill, the challenge and the whole new perspective of independence it gives you. That tourist-y feeling to try everything new to you. Char. And then I go back to reality and see that promo flights from airline companies are yet to come so I hold off my reins and get back again to work. Hahaha. Early morning walk to the bus station. On our way to Ayutthaya. Anyways, what did our trip to Bangkok (first out of the country in my case) give us? I'd say a lot. But let me expound on them. First, I had this realization that it's really difficult to be in a place where hardly anyone understands half of what you're saying or trying to tell them. This struck when we started asking for directions from the locals. Everyone's real friendly but most of them are not learned in English. You then have to rely with their hand gestures as they show you which direction to walk and which bus number to take. Plus your watch. I've noticed that aside from the directions given by locals, they also tell you how many minutes or hours it would take for you to get from one destination to the other. 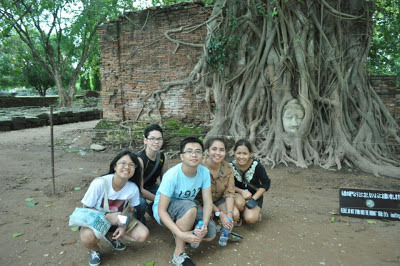 For example, getting to Ayutthaya by train would take one approximately 2 hours and 14 minutes. We timed our train ride and shoot, we really are there on time. Cool. Sharpening your mental map and simple right and left orientation would really save you from getting lost in Bangkok's maze. Also, because not everyone of us were able to register our sim cards for roaming, we have to rely on landmarks when assigning our meeting places. We are six in the team so most of time, we have to split into twos or threes to cover more ground. We did this when we went shopping at Pratunam District and Chatuchak Market. Fortunately, we were able to manage getting through these shopping labyrinths and also navigate our way through the city's ins and outs. We also take pride of the fact that we ditched cab rides-- which most tourists take for convenience-- and opted for buses and trains even if the probability of getting lost is higher. Hahaha. Hey, we're back in Manila safe and sound so you might as well try it. Hahaha. 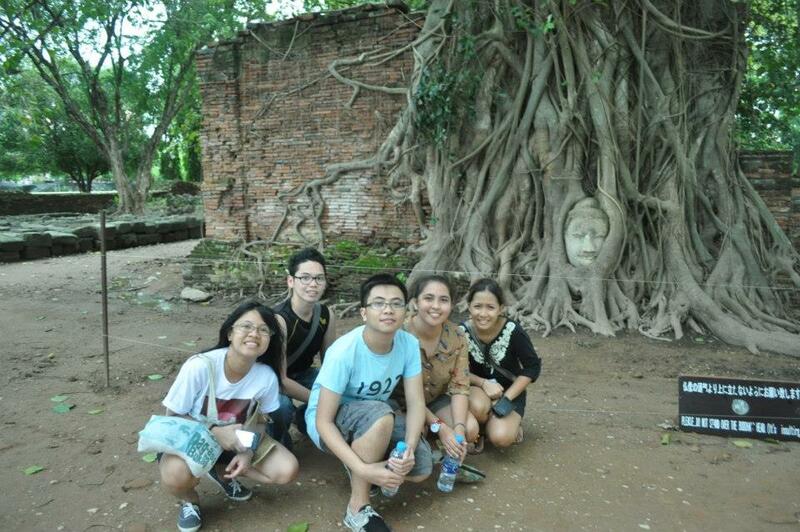 Right beside the buried Buddha. Second, I felt that Bangkok relies heavily on their tourism industry. They're dubbed as one of Asia's shopping havens. They're also famous for the many temples they were able to preserve and restore-- competing with Cambodia's Angkor Wat. Why, the unique food and culture experience they offer is also one-of-a-kind. And this is where Bangkok funnels its income. The fact that their locals are given free entrance to most of their tourist spots-- a good example is the Grand Palace Complex-- is already proof that the industry is booming. They must be really getting a lot from foreign tourists to make it free for their locals. This is really cool. But what I admired most were their efforts to maintain, preserve and restore these decades or centuries-old relics. It's both difficult and expensive and is really a good investment for their country. I hope the Philippines learns from this. We're proud to tell everyone that we've got a lot of history and that our culture is very rich and unique but we never really take the cudgels of preserving such heritage. Look at what happened to Puerto Princesa Underground River and the Hundred Islands before their respective local government units took over. Or just see Manila-- Intramuros, The Met, Fort Santiago-- to see what I mean. I believe, there are already efforts to beautify these tourist spots but there's a lot more to do after that. I hope the Philippine Government and even local government units take this seriously. We've got a lot to offer so we might as well capitalize on all of those. Third, it's a fairly walkable city. Or maybe because we just walked a lot to save on fares. Hahaha. I'm categorically attesting to that. But let me just draw a point on this lesson. I felt that Bangkok or Pradiphat District in our case was fairly walkable. Of course, there are a lot of food and merchandise stalls built by the sidewalk, but I would like to believe that the designated bus stops on every street corner really helped in making the sois (Thai for street/road) safe for leisurely walks. There are no "stray" passengers on the sides of the streets because they're all waiting for their bus, scooter or tuktuk rides by the waiting sheds. On one of our trips, we were snobbed by the bus driver even if his bus is barely full of passengers because we weren't there on the bus stop. Hahaha. On our next trips, we made sure that we're standing by their sheds to get the bus driver's attention. Oh and did I mention that their sheds are like mini- vineyards? Instead of the usual concrete roof and benches we commonly see in the Philippines, Bangkok uses steel sheds with "~crawling leaves" (I dunno what they're called anyway) as roof. Greeeeeen! Hahaha. Walkability also means lesser distractions and eye sores (read: posters of EPALiticians). In any other place in the Philippines, we're often reminded that half of our taxes fund an infrastructure project and the remaining half is used to print <insert name of EPALitician here>'s face, complete name and his/her ~catchy tagline. Haaay! During our trip to BKK, we haven't seen any of that. Ok, so we've seen the face of their royalties in every government office complete with wreaths and ribbons but other than that, none. Nil. Nada. Another plus point we have to at least adopt here, I think. But sans the ~royalty pictures. As in wala nalang. A public servant should really do public service-- he doesn't have to shove into our faces how much he did to improve our current state. Either we know it or we haven't felt it at all. Finally, Bangkok is just like the Philippines. Except of course with the language or a bit on culture. But the fact that we're both from Southeast Asia, we do have a lot in common. We both love everything that is connected with food and eating. We find so much interest in our respective pasts and do whatever we can to make this rich heritage accessible to everyone else that seeks to know us better. We're hospitable and warm. We never get tired of smiling. We even find it fun to help other people and make them feel comfortable in anyway we can. We both have our bad sides even worst ones-- crime, corruption, bad politics and tough-to-beat flashfloods. But what we both take pride of, is that we can rise above all of these and feel braver than before. Maybe Thailand made more efforts to aim for something better and put themselves in the higher rungs of development. The Philippines is exerting more effort now than before and I would like to believe this is a good thing. We just have to push more and eventually we'll get there. This post was recently submitted as an entry to the Asian Air Program blog contest organized by Korean Air Southeast Asia. For more information, you may visit their Facebook fanpage or refer to the contest guidelines through this event link.